Level Up is released on DVD September 19. And to celebrate we have a great competition for you and 3 copies on DVD to give away. Matt (Josh Bowman) and Anna (Leila Mimmack) are a typical young couple living in London. Anna is enjoying a bright legal career while video gaming-obsessed Matt is a little lost, searching for direction in life. The morning after an unsuccessful date night, masked thugs kidnap Anna before assaulting Matt and locking him into a body vest that contains a mysterious package. Our reluctant hero is given a mobile phone and told to follow instructions and deliver the package to the secretive Dmitri (Neil Maskell). If he fails, or tries to seek help, they will kill Anna. Over the course of one thrilling, high-octane day, Matt must progress his way across London as a host of menacing characters and unpredictable situations test his resolve and push him to the limits. 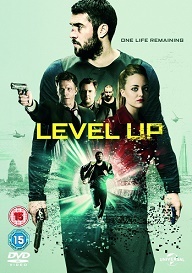 Starring Josh Bowman (Revenge), Will Houston (Sherlock Holmes), Leila Mimmack (High Rise) and Neil Maskell (The Football Factory), LEVEL UP is a truly unique, bold, distinct and unhinged British Thriller full of twists and turns and adrenaline-packed action.